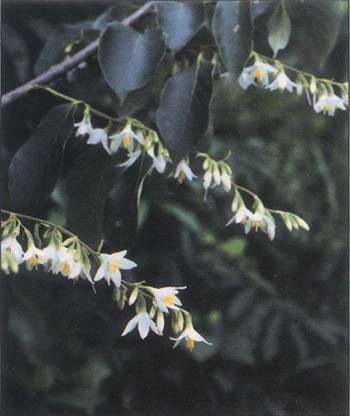 Apart from the distinction already made between Siam benzoin and Sumatra benzoin, there are two English terms used to describe the resinous product from styrax trees: benzoin (or gum benzoin, although use of the word gum is strictly incorrect since benzoin is not a water-soluble polysaccharide) and gum benjamin. The latter term is used as the description in Singapores trade statistics and is the designation employed by many Singaporean traders. Since Singapore is the major international trading centre for benzoin, the term gum benjamin is often used elsewhere in trade. In common usage in Indonesia benzoin is known as kemenyan. In Indonesian trade statistics, however, benzoin is misleadingly called frankincense, a term usually applied to the resinous exudate from Boswellia spp. of Arabia and Africa. It is possible that this use of the term frankincense derives from benzoin of Indonesian origin that was traded by the Arabs, who regarded it as a form of frankincense, at least 700 years ago. In Malaysia, benzoin is called kemenyan or kemayan. Malaysian trade statistics use the term gum benjamin. In Thailand it is known as kamyan or kumyan and in Lao PDR it is called kam nhan, nyan or yan. Benzoin appears in international trade in several forms. Most Siam benzoin exported from Lao PDR is in the form in which it is collected from the tree, after it has been cleaned and graded. It consists of hard, usually cream-coloured/pale orange pieces, which if broken reveal a milky white colour. The benzoin is quite pale in colour when freshly collected but darkens gradually during storage to a sandy-orange colour. During handling and transport from its collection to the point of export, larger pieces are inevitably broken down to smaller ones and a significant proportion of dust and siftings is produced. Some benzoin which finds its way to Bangkok through Thai traders living near the border with Lao PDR, and which is used in the preparation of traditional medicines (but also occasionally exported), is formed in larger, dark brown lumps with a glassy appearance. Sumatra benzoin similar in appearance to the Siam benzoin described above is traded (often known as almonds), and with the same sort of grades, but there are also substantial quantities of darker, dirtier, lower grade material. Even more common is a semi-processed form of block benzoin which generally contains pieces of damar embedded in a matrix of low grade benzoin. The use of damar is an important feature of the production of block benzoin and accounts for the large differences in volume between exports of benzoin from Indonesia to Singapore (the major initial destination) and subsequent exports of benzoin out of Singapore. Occasionally, pure benzoin almonds are used in the production of block benzoin, instead of damar. The chemical compositions of the two types of benzoin account for their sensory characteristics and determine the uses to which they are put. There are both similarities and differences in composition and this means that although they are both used for flavour and fragrance purposes, they often go into different parts of the markets. Both contain mixtures of organic acids and esters, along with numerous other - mostly minor - components, and both can be described as balsamic in odor. However, in Siam benzoin the chief constituents are benzoic acid and its esters (such as coniferyl benzoate, benzyl benzoate and cinnamyl benzoate), while in Sumatra benzoin the major constituents are cinnamic acid and its esters (such as coniferyl cinnamate and cinnamyl cinnamate). Vanillin is present in both types of benzoin and gives rise to its familiar vanilla odor (most readily detected in the Siam type). Using samples of benzoin obtained from regional fieldwork, qualitative analyses were carried out at the laboratories of the Royal Forest Department, Bangkok. The results illustrate the similarities in composition of the two types of benzoin, but by separating and detecting the cinnamates in the Sumatra type it was also possible to distinguish them. The results are discussed in more detail later (Chapter 8, section 8.1.3 and Appendix 2). They also confirm the presence of damar in some of the semi-processed block forms of benzoin. Benzoin comes from tree species of the genus Styrax in the family Styracaceae. Styrax contains about 130 species of trees and shrubs occurring in tropical to temperate climates. Three centres of distribution are described: southeastern Asia, southeastern North America to South America, and a single species in the Mediterranean. Siam benzoin is obtained from S. tonkinensis (Pierre) Craib ex Hartwiss. Sumatra benzoin is collected from two species: S. benzoin Dryand. and S. paralleloneurum Perkins (sometimes spelled paralleloneurus). The latter two species are cultivated for benzoin production in different parts of Indonesia and are said to produce benzoin of different qualities; the two types are not separately identified in trade however. 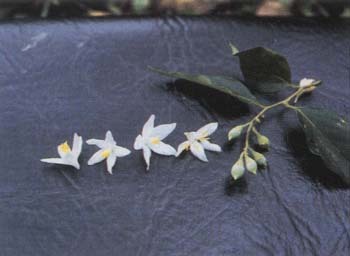 Two varieties of S. benzoin occur in Peninsular Malaysia, var. benzoin and var. hiliferum Steenis. Neither is tapped for benzoin on a commercial scale. In China, S. tonkinensis, S. hypoglauca Perk. and S. cascarifolia are tapped but the products, though used domestically, are not believed to enter world trade.